Today I'm sharing with you a very an effective face mask that is very easy to make. The main ingredient of the mask is a carrot. Carrot can really work wonders for your skin because it's rich in minerals, antioxidants, and vitamin A that helping in maintaining your skin health. The best part of this vegetable is it suits all skin types. Carrot help to get rid of dry skin prevents signs of aging like pigmentation, wrinkles, and uneven skin tone. On the other hand, honey can help moisturize, fight aging, and fight bacteria, plus, it’s loaded with nutrients, antioxidants, and healing compounds. So If you are looking for a very easy and effective face to repair your skin then try this DIY face mask. For this mask, you can use carrot in different ways, for instance, you can use a finely shredded carrot or Boiled carrot or you can use carrot juice. For Today's mask, I used the finely grated carrot. Add carrot and honey in a small bowl. Mix them well. Apply it on your skin. Let the mask dry for at least 15 minutes or up to 30 minutes, enough to dry, then rinse your face with warm water. Finish with moisturizer. For the best results possible, make this treatment on a daily basis or every alternate day. The mask is a natural remedy that can remove also scars caused by acne. You can use the same mask for your lips. It makes your lips well hydrated and helps to lighten your dark lips naturally. What’s your favorite homemade treatment for skin? 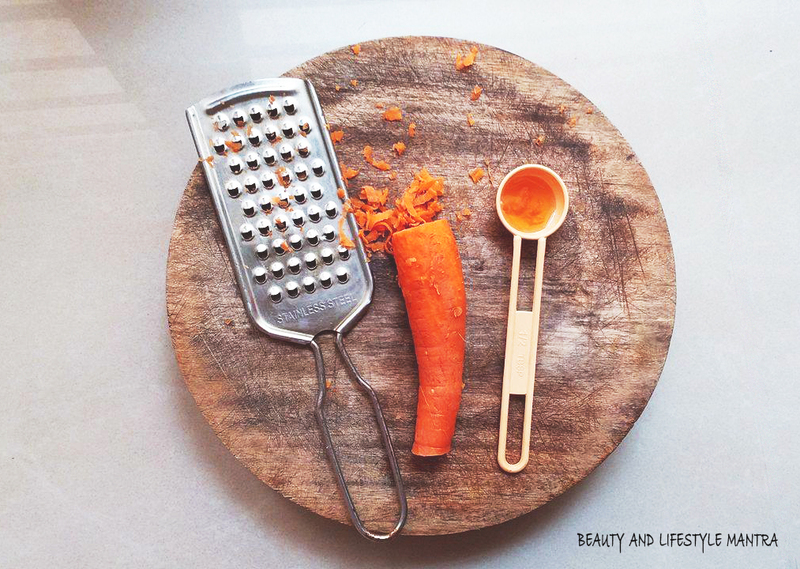 I love carrots in my beauty regimen. So, I must give it a try. Our kitchen has so many wonders! Thanks for this DIY beauty recipe. Simple and with easily available ingredients. Would try this weekend. Nice DIY, perfect recipe for summer. It had almost slipped off my mind how amazing carrots are for skin care. Thanks for rekindling my interest in those juicy veggies 😊 A few DIYs using the same now will brew in my mind.